Normally you do not even need to think about the browser’s cache. You may not even know what the web cache does. The web cache stores some of the web pages you have visited on the PC, so that when you visit the same site it does not need to get all the data from the Internet again. Thus the web cache uses space on the hard disk. The web cache automatically clears out old items and adds new items as the user browses. In day-to-day usage the cache operates in the background with the user not needing to worry about it. However, if the disk drive the cache is stored on runs low on space, then the cache may need to be cleaned out to free some space. It can also be moved to another disk to help with disk space management. Finally, it can be moved to another disk, if that other disk is faster, to help improve the performance of the system. This article covers cleaning out the web cache, and optionally moving it, for today's most popular browsers. For deeper web cache cleaning a third party tool, such as the popular Piriform CCleaner can be used. Scroll down to the Clear browsing data option and select Choose what to clear. Ensure Cached data and files is checked and then select Clear. 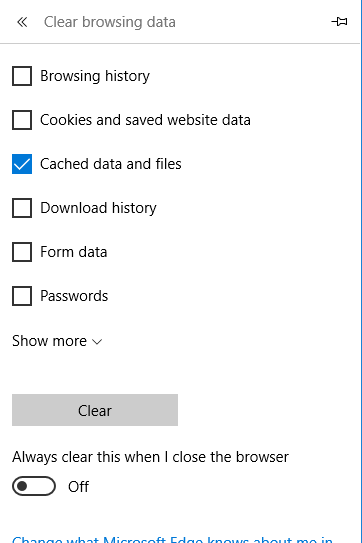 Unfortunately Microsoft Edge does not have an option to move the cache location. Some Windows users have used a workaround using a symbolic link (symlink). However, other users have reported trouble with Windows apps after moving the Edge browser cache. This is probably due to Edge being more integrated with Windows than other browsers. Hence another browser may be a better option on systems that have small disks and the browser cache needs locating to another disk. 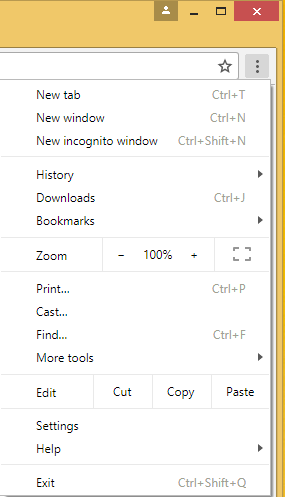 Open the Chrome settings by clicking the ellipsis icon and selecting Settings from the menu. Go to the bottom of the page and select Advanced. With the settings page open close all other tabs. 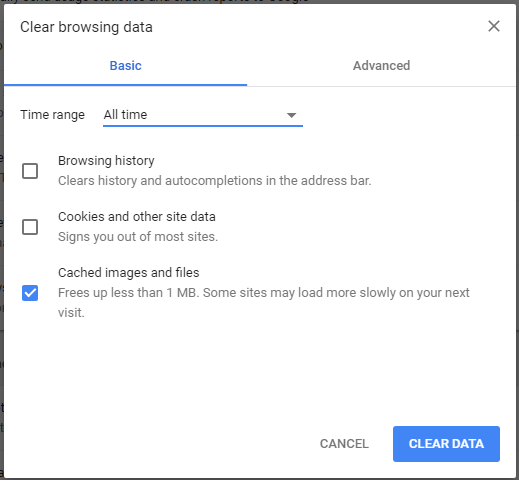 Select Clear browsing data (under Privacy and security), ensure that at least Cached images and files is checked, and that Time range is set to All time. Select the Clear Data button data to empty the web cache then close the Settings tab. 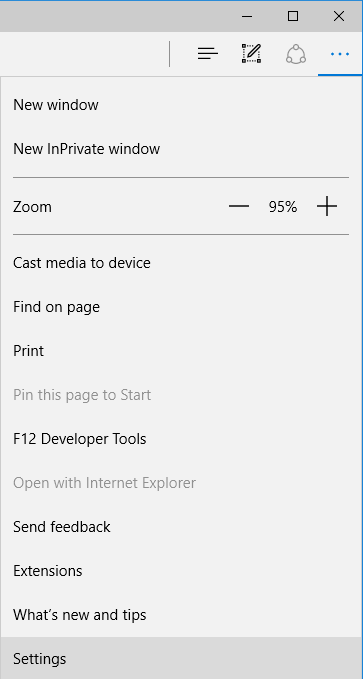 As for Microsoft Edge there is no option available to move the Chrome cache. Therefore, it needs to be done manually. A new cache directory must be created and Windows redirects the cache to this new location with a symbolic link. 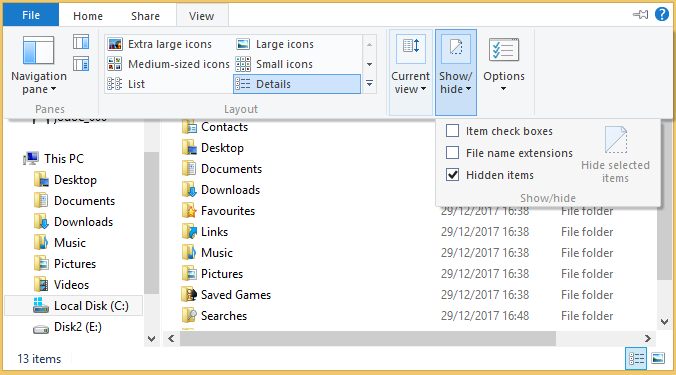 First create the new cache folder with Windows File Explorer, e.g. E:\Temp\ChromeCache. Open the logged on user’s folder (usually under C:\Users) and go to AppData\Local\Google\Chrome\User Data\Default then delete the Cache folder. Open a Command Prompt by holding the Windows key and press X. Then select Command Prompt. In Windows 7 select Command Prompt from the Accessories folder. Alternatively hold the Windows key and press R, type cmd and press the Enter key. mklink /J "C:\Users\John Doe\AppData\Local\Google\Chrome\User Data\Default\Cache"
Note the use of quote marks for paths that have spaces. Close the Command Prompt window (or type exit and press Enter). Now whenever Chrome tries to write to the cache, Windows redirects it to the new location. A dummy cache folder will be seen in AppData\Local\Google\Chrome\User Data\Default (the cache folder and the contents are located at the new location, but also appear in the old location when viewed in File Explorer because of the symbolic link). Select Privacy and Security and scroll to Cached Web Content. Select the Clear Now button. Close the options when the delete has finished. For the preference name enter browser.cache.disk.parent_directory, click OK. For the string value enter the location for the cache. For example if it is going to be located in E:\Temp then enter that for the browser.cache.disk.parent_directory string. Close Firefox. When Firefox is next run the cache will be generated under the new location, in this case E:\Temp\Cache. The Opera web browser is based on software that was used for Google Chrome. Hence cleaning and moving the Opera cache is similar to the method used for Chrome. 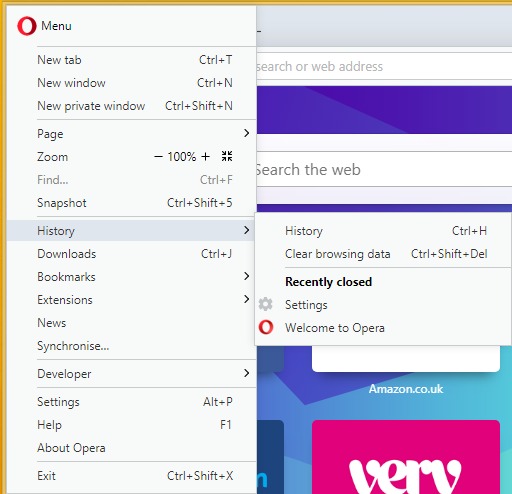 To clear Opera cache use the Opera menu and select History. 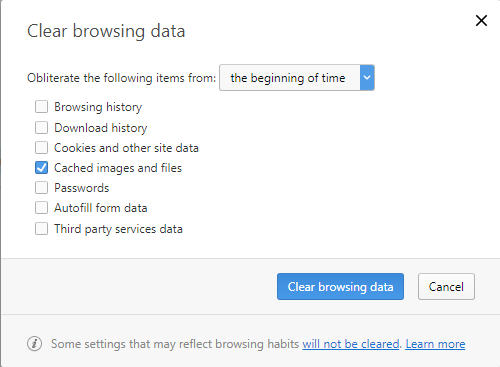 Select Clear browsing data (this option is also available via Settings and Privacy & Security). Ensure it is from the beginning of time and that Cached images and files is checked. To move the Opera web cache, as for Chrome, start by creating a folder for the new cache, e.g. E:\Temp\OperaCache. With Opera closed use File Explorer to delete the old cache folder. As for Chrome it is in the hidden AppData directory in the logged on users folder. Go to AppData\Local\Opera Software\Opera Stable and delete the Cache folder. mklink /J "C:\Users\John Doe\AppData\Local\Opera Software\Opera Stable\Cache"
Close the Command Prompt. When Opera next runs the cache is redirected to the new location. Chose Internet options and on the General tab under Browsing history select the Delete button. As a minimum Temporary Internet files and website files must be checked. Select Delete and the web cache will be cleared. A message will appear on IE when the process has finished, and you can close the Internet Options dialog. Close all open programs except for IE. Clear the IE cache as above then select the Settings button on the Internet Options dialog. In Web Data Settings on the Temporary Internet Files tab select Move folder. Select a new location. For example the folder E:\Temp\ was created using File Explorer. Then E:\Temp\ was selected from the Move folder button so that the new cache location became E:\Temp\Temporary Internet Files. Click OK and accept the message to confirm the move, the PC may need a restart. 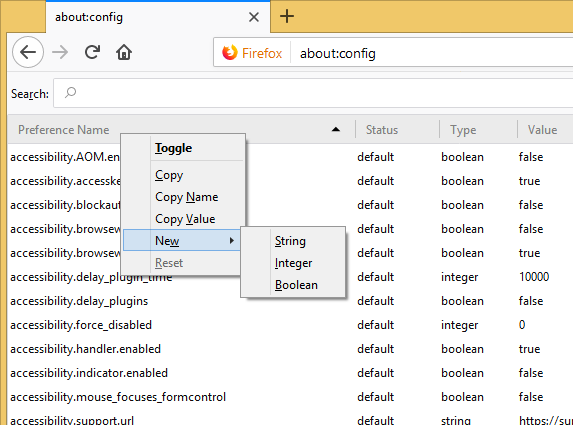 The major web browsers of Microsoft Edge, Chrome, Firefox, Opera and IE all provide a settings option to delete the files stored in the web cache. To relocate the web cache Firefox and IE provide enhanced option settings. For Chrome and Opera a Windows symlink (symbolic link) can be used. Third party computer cleaners, such as Piriform’s CCleaner, can be used to clear browser cache items. For a full list of all the articles in Tek Eye see the full site Index. Win 8.1 tried and tried could not create junction for opera 26. Return: "The syntax of the command is incorrect"
Tried the windows site to check syntax, still no luck. syntax ok, they don't show quotes but you've explained that. Tried quotes and no quotes. Solved the junction problem using a small program called Junction Link Magic from RekenWonder. ↓markdown↓ CMS is fast and simple. Build websites quickly and publish easily. For beginner to expert.